When it came time to follow up the success of Hot Rod Hootenanny, Capitol's Fred Rice wisely stuck to the arithmetic of the first LP: great Ed "Big Daddy" Roth-inspired songs and the best session musicians and Capitol Studios = another outrageous LP! 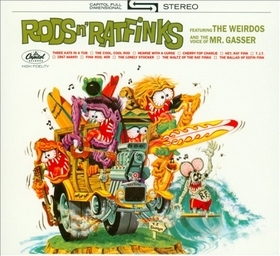 Rods n'Rat Finks continued the party started on the first album under the direction of Gary Usher. Piling in the Weirdos' woodie for this road trip were Glen Campbell, James Burton and Billy Strange on guitar, Ernie Freeman on piano, Carol Kaye and Steve LaFever on bass, Earl Palmer on drums and Steve Douglas on sax. Gary Usher, Richard Burns and Chuck Girard returned to do vocal duty. And, of course, "Big Daddy" himself created another screaming-technicolor-suitable-for-framing LP cover! Looking at the illustration, if you peep past the wacked-out jalopy, you'll spy Rat Fink hanging at least two as he shoots the curl. Take that, Sponge Bob! Exclusive release for Record Store Day 2011.